Нуждаясь в новом истребителе для RAF, боевые самолеты которых уже не могли перехватить такие бомбардировщики как Fairey Fox, Министерство авиации выпустило спецификацию F.9/26. Требовалось создать одноместный истребитель с мотором воздушного охлаждения, вооруженный ДальшеMore>>> двумя пулеметами Vickers. Английские фирмы представили свои машины, но, в конечном счете, победителем стал Bristol Type 105 Bulldog, который немного обошел Hawker Hawfinch. Прототип Bulldog Mk I впервые поднялся в воздух 17 мая 1927 года и в дальнейшем был оснащен крылом увеличенного размаха для установления рекордов высоты и скороподъемности. На испытаниях на смену Bulldog Mk I пришел прототип Bulldog Mk II, отличавшийся удлиненным фюзеляжем и имевший фирменное обозначение Type 105A, который и был запущен в серийное производство. Первой в июне 1929 года новые самолеты получила 3-я эскадрилья в Апэйвоне, графство Уилтшир. Bulldog Mk II представлял собой одностоечный биплан с металлическим каркасом, обшивка которого была выполнена в основном из полотна. Лишь в носовой части фюзеляжа использовались панели из легких сплавов. На этой модификации был установлен двигатель Bristol Jupiter VII. Bulldog широко использовался RAF - в общей сложности 312 машин всех модификаций состояли на вооружении не менее 10 эскадрилий вплоть до 1937 года. Помимо RAF, Bulldog также служили в ВВС Австралии, Дании, Эстонии, Финляндии, Латвии, Сиама и Швеции. THE Bristol single-seater fighter exhibited at the Paris Aero Show was designed and built by the Bristol Aeroplane Co., Ltd., of Filton, Bristol, and is an all-metal machine in which the material of construction is mainly steel, and more particularly sections formed from flat steel strip, the Bristol firm having done a great deal of research work on this type of construction during the last few years. The machine carries the usual single-seater fighter armament in the form of two machine guns firing "through" the propeller. Fuselage. - Entirely of metal construction, with the exception of the fabric covering. The front portion is of circular section steel tube construction, but the rear portion, from the pilot's cockpit to the tail, has longerons and struts of strip steel, formed to somewhat unusual sections. Wings. - Arranged in the form of an unequal span, unequal chord biplane, the wings are, with exception of the fabric covering, of all-steel construction. The spars are built up from steel strip, flanges and webs being joined by riveting. In a later type of Bristol spar only a very small number of rivets are used, the "curled" edge of the strip serving to bind the parts together. The wing ribs are of channel section, but a section which has ridges and "curls" to prevent buckling, thus making the use of very thin material possible. Both upper and lower wings have their trailing edges cut away in the centre to improve the view. Frise ailerons are fitted to the top plane only. Tail. - Both vertical and horizontal tail surfaces are of cantilever type, with a rather unusual trimming gear for the tail plane. It is of steel construction and fabric covered. Engine Installation. - The "Jupiter" engine is particularly neatly mounted in the nose, and the cylinders are carefully cowled for streamlining. The petrol tanks are in the top plane, and direct gravity feed to the engine is employed, avoiding the use of pumps. Undercarriage. - Oleo-pneumatic, with long travel. The telescopic front legs are attached at their upper ends to the top longerons instead of to the bottom, and are neatly faired into the fuselage covering. THE Bristol Aeroplane Co., Ltd., is exceptionally well represented at this year's Paris Aero Show. Not only is a very full series of engines exhibited, but a complete "Bristol" aircraft as well. 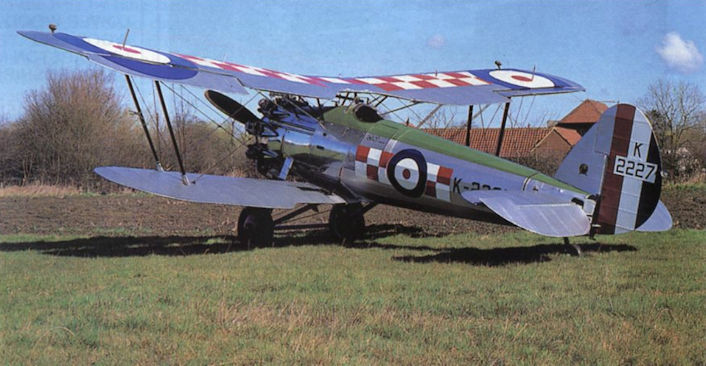 This is a single-seater fighter of very taking appearance and all-metal construction, and is obviously related to the Bristol "Bulldog" which made its appearance at the R.A.F. Display last week at Hendon, where it aroused very favourable comment. The manner of exhibiting the machine is one which was, we believe, "invented" by one Sergeant Turner at the Agricultural Hall, Islington, during the war, when captured enemy aircraft were so exhibited. It consists in "stripping" the machine to the centre line, so that when viewing it from one side one obtains an impression of the machine's lines and general appearance, and from the other all the constructional details can be examined with the greatest facility. It would be difficult to imagine a better way of showing an aircraft, provided one really wishes people to see it. There are, of course, cases where it is kinder to the constructor to cover up as much as possible! In the Bristol single-seater fighter Great Britain has a worthy representative at the Paris Show. The machine incorporates some of the very latest forms of construction, making extensive use of corrugated sections formed from flat steel strip, a form of metal construction upon which a vast amount of work has been done in England, and in which Great Britain holds an unchallenged position. Other nations may have gone farther with welded construction, or have developed forms of duralumin construction that equal ours, but in the steel strip form of metal work we need fear comparison with no one. Consequently it is small wonder that from the moment the doors of the Grand Palais were opened, the Bristol stand was a centre of attraction for the more discerning visitors. The "Bristol" single-seater fighter is a very fine example of modern British aircraft, and it is doubtful whether, at any Paris Aero Show held since the war, so up-to-date a British service machine has ever been exhibited. With a performance which is quite remarkable, the new machine represents the latest ideas in both aerodynamic and structural design, and thus the machine well merits the closest inspection. Not the least interesting feature is the way in which performance is maintained at altitude. For example, at 20,000 ft. (6,100 m.) the speed is 172 m.p.h. (277 km./h. ), while that altitude is reached in the astonishingly short time of 12 mins. Obviously, we have here a machine which is a good deal out of the ordinary in the matter of performance. Features in the design which make for aerodynamic efficiency are a carefully streamlined fuselage, with the engine neatly faired into it, a biplane wing arrangement in which the top plane is of greater span and chord than the lower: simple single-bay wing bracing, and generally a careful suppression of all causes of avoidable resistance. In designing the machine a great deal of attention was paid to the subject of providing the pilot with a good view, as evidenced by the high position in relation to the top plane, whose trailing edge is cut away in the centre, and the centre-section itself made of thinner profile. The lower wing is of smaller chord, and in addition the trailing edge is cut away near the fuselage to give a downward view. Finally, the degree of stagger is such that the pilot can look over the lower leading edge at a very useful angle, and lastly, the fuselage deck slopes from the wind screen down to the engine, so that the view for landing is also very good. Manoeuvrability is another essential quality in a fighter, and the "Bristol" single-seater fighter is reported to be extremely manoeuvrable without being at all unstable. The ailerons, fitted to the top plane only, are provided with the, by now, well-known Bristol-Frise type of balance, which does not impose a torque on the aileron as does a horn balance, while at the same time they introduce but small yawing moments. The rudder and elevator have a form of shielded balance which gives light control loads at all speeds. On the ground also the machine is very manoeuvrable, partly on account of the attachment of the oleo legs to the top instead of to the bottom longerons, thus preventing rolling. The tail skid swivels. Accessibility of all equipment, engine accessories, etc., has been particularly studied, quickly-detachable doors being provided. The wireless apparatus is fitted complete in a crate which slides out through a door in the side. The military load includes pilot, parachute, two Vickers guns and 1,200 rounds of ammunition, C.C. gear for the guns, gun sights, oxygen and electrical equipment, instruments and wireless apparatus. The average total weight of the military load is 528 lb. (240 kg.). As already mentioned, the machine is built entirely of metal, and more specifically of steel, as regards the more highly-stressed members. Duralumin and aluminium are used for fairings, doors, etc. Broadly speaking, two forms of construction are employed in the fuselage. The forward portion, which carries the engine, pilot and equipment, is built up of circular-section steel tubes forming longerons and struts. The joints between these are in the form of flitch plates with bolts passing through the tubes, the ends of which are provided with cylindrical sleeve pieces on to which are soldered flat-faced washers. The rear portion, from the cockpit back to the tail, is built in the form of a Warren girder, the longerons and struts being formed from fiat steel strip into circular sections with projecting flanges for external riveting. Outside the main structure are added light hoops and stringers which carry the fabric and bring the square section up to a rounded form. The undercarriage is a plain Vee type, but is unusual in that the telescopic (front) legs are attached not to the lower longerons as is usually done, but to the top longerons. The rear struts are attached at their upper ends to the spar of the bottom centre-section. The shock-absorbing medium is oil, and compression rubbers, the first 2 1/2 in. of travel being taken on the oil only, the remaining 4 1/2 in. of travel on the rubbers contained in the top container. Like the fuselage the wings are of all-metal construction, with the exception of the fabric covering. They are of normal two-spar type, the spars being made from flat steel strip, rolled and drawn to the final section, and the webs and flanges together forming a box-section whose separate members are joined by riveting. The drag bracing struts are circular-section steel tubes, and in the outer bays these pass through both spars, extending aft beyond the rear spar to form supports for the hinges of the Bristol-Frise ailerons. The wing ribs are high-tensile steel channels. The controls are of normal type as regards their action and general disposition, but special provision has been made in the case of the foot bar for the rudder control for adjustment to suit various pilots. The seat has a neat adjustment for height, by means of which the pilot can raise and lower himself within fairly wide limits, according to whether he wishes to be well screened from the wind, such as for a prolonged flight, or to have an unobstructed view either for fighting or for landing, etc. The petrol system of the "Bristol" single-seater fighter is that which is now almost universal in Great Britain, i.e. with two tanks in the top plane, giving direct gravity feed to the engine. On each side is a tank, built into the wing, of 35 gallons capacity, and gauges are provided which can be read from the cockpit. The oil tank is suspended from the lower longerons, just aft of the fireproof bulkhead, and is shaped to conform to the fairing lines. The tank incorporates a neat oil-cooling device. The Bristol "Jupiter" engine is mounted on a rectangular plate of sheet steel with flanged-over edges. Steel channel pieces are riveted to the back of the engine plate in order to reinforce the corners. The plate is anchored to the fuselage by four steel tubes, whose forward ends are riveted to the corners of the engine plate, while the rear ends are bolted to the fuselage joints by tapered bolts. The cowling of the engine has been well thought out, and there are front and rear fairings to each cylinder which, with the aluminium "helmets" fitted over the valve gear of each cylinder, reduce the drag of the projecting cylinder heads to a minimum consistent with sufficient cooling. The main dimensions of the "Bristol" single-seater fighter are: Wing span, 33 ft. 10 in. (10 -32 m.); wing area, 307-15 sq. ft. (28-55 m2. ); length o.a., 24 ft. 10 in. (7-6 m.). The weight, empty, is 1,990 lb. (905 kg.). Fuel and oil, 607 lb. (276 kg. ); military load, 528 lb. (240 kg.). Total loaded weight, 3,125 lb. (1,421 kg.). Wing loading, 10-17 lb./sq. ft. (49-8 kg./m.2). Two complete aeroplanes will be exhibited on the stand of the Bristol Aeroplane Co., Ltd., one a single-engined four-seater passenger machine with Bristol "Neptune" engine, and the other a "Bulldog" single-seater fighter with Bristol "Jupiter." The second machine to be exhibited on the "Bristol" stand will be one of the "Bulldog" single-seater fighters of which a few months ago several were ordered for use by Royal Air Force squadrons, after very exhaustive and searching tests. The machine has now also been ordered by other countries. The "Bulldog" can be fitted with the Bristol "Jupiter" series VII, supercharged engine, when high speed at great altitudes is desired, or with the series VIA "Jupiter" when the machine is not expected to operate much above some 15,000 ft. The pilot's view is good in all directions; this has been achieved by cutting away the trailing edges of upper and lower wings near the centre-section and body, respectively. The centre-section itself is of thin section, so as to interfere as little as possible with the view. The "Bulldog" is an all-metal machine, built almost entirely of high-tensile strip steel. In the fuselage, two distinct forms of construction are to be found: tubular in front and the special "Bristol" strip steel construction at the back. As this has been very fully described and explained in FLIGHT, by Mr. Pollard, there is little need to go into great detail here. The wings are also of steel strip construction, and details of spars, ribs, etc., have, in this case, also been given in FLIGHT, by Mr. Pollard. As our space is limited, it will be preferable to devote it to the general features of the "Bulldog." The pilot's seat is of the bucket type, designed to accommodate a parachute. Its height is adjustable in flight over a range of 4 1/2 ins. The pilot's harness is so arranged that it can be locked in any desired fore and aft position over a range of 7 ins. The pilot's windscreen, it will be observed, is of unsymmetrical shape in order to give complete protection from slipstream draught. The equipment includes two Vickers' machine guns, mounted one on each side, in gun tunnels and readily accessible from the seat, a wireless apparatus and an oxygen installation. The bottle of the latter is held in a quick-release cradle, and can be withdrawn through one of the side doors. The gross weight of the "Bulldog" is 3,250 lbs., of which 1,153 lbs. is load, comprising pilot, military load, fuel and oil. The total fuel capacity (in tanks in the top planes) is 70 gallons, and the oil capacity, 3 gallons. The military load comprises two Vickers' guns, 1,200 rounds of ammunition, parachute, C.C. gear, gun sights, oxygen apparatus, electrical equipment, instruments, wireless, signal pistol, and fire extinguishers. When fully loaded, the "Bulldog" climbs to 20,000 ft. in 13 mins., and the speed at that height is 165 m.p.h. A normal cruising speed of 130 m.p.h. can be maintained without in any way overrunning the engine. A well-known test pilot who has flown it, reports that the rigidity of the metal structure is such that when diving the "Bulldog” at a maximum speed of 270 m.p.h. the machine is just as steady as it is when cruising at 130 m.p.h., with no tendency to nutter. NO British aircraft firm has been a more frequent and consistent exhibitor at Paris Aero Shows than the Bristol Company. Scarcely an aero exhibition has been held in the Grand Palais but what Bristol aircraft have been there to uphold British prestige. It is therefore gratifying to find that again this year we shall see the familiar name "Bristol" on the banners flying above the stands. The exhibit on the aircraft stand (Bristols are also showing engines on a separate stand) will include a 1933 model "Bulldog" (Bristol Mercury IV S.2 engine) and specimens of Bristol types of metal construction. The 1933 model "Bulldog" is essentially a development of the "Bulldog IIA," which is the standard single-seater fighter of the British Royal Air Force. All the improvements which long experience of the earlier machine has suggested have been incorporated in next year's model. The most notable improvement is that associated with performance. By installing the more powerful Mercury IV S.2 instead of the Jupiter VII F advantage is taken of the smaller diameter of engine, while the extra power plays its part also. Secondly, by cowling the engine with a "Townend" drag-reducing ring, the performance is still further improved. The shape of the engine has made possible the installation of a new type of exhaust collector ring, which not only gives lower drag but actually improves the cooling. In place of double wing bracing wires the 1933 "Bulldog" has single wires of greater cross-sectional area, which again reduce drag and also vibration. By choosing a thicker wing section (R.A.F. 34 to be more explicit) it has been possible to house the petrol tanks entirely within the wing contour, thus again reducing drag. Another result of using this wing section is that it has been possible to reduce the chord of the lower wing slightly, thereby improving the view. Stiffer ailerons, mass-balanced, have been fitted on the new model, and each aileron hinge is self-aligning. The horn balance of the elevator has been increased in area, making the elevator lighter and smoother in operation. All these improvements have been carried out without introducing departures from the features of design found successful in the older model. At last year's Display a Bristol "Bulldog IV" was shown. It appears again this year, but with a different engine: the Bristol "Perseus" sleeve valve engine. The Bristol Aeroplane Co., Ltd., regards this type of engine as an important part of the firm's programme, and the performance of the machine should be watched with interest, although the cowling will prevent visitors to Hendon from seeing much of the engine itself. The "Bulldog IV" is a day and night fighter, and has a wing span of 33 ft. 8 in. Bristol Bulldog. Появившийся в 1929 году, Bulldog предназначался для замены в британских ВВС истребителей Sopwith Snipe эпохи Первой мировой войны. Самолет Bulldog типичен для истребителей 1920-х годов. По компоновке он не сильно отличался от Snipe. На нем стоял мотор воздушного охлаждения, вооружение состояло из двух синхронных пулеметов винтовочного калибра, установленных между двигателем и кабиной. Силовой набор выполнен из металла, но обшивка - полотняная. Bulldog поставлялся на экспорт, в частности, в Швецию (изображен самолет шведских ВВС); в Финляндии несколько самолетов данного типа эксплуатировалось даже в годы Второй мировой войны. "Бульдог Mk.IVA" старшего сержанта Т.Ууггу из состава эскадрильи LLv 26, который был сбит 1 декабря 1939г. звеном И-16 тип 10 старшего лейтенанта Ф.И.Шинкаренко 4-й эскадрильи 7-го ИАП.